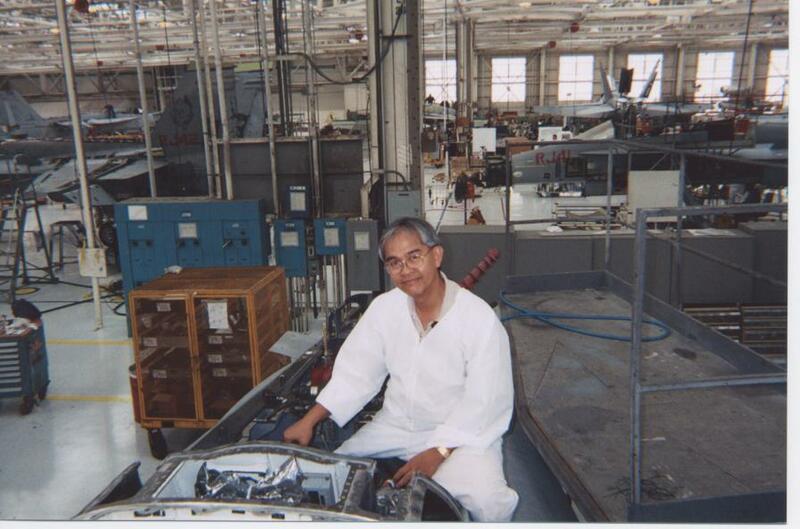 Below are photos of skilled Aircraft Maintenance Technicians, or Artisans, at the NADEP facility on the U.S. Navy's North Island facility in San Diego, CA. The professionals that have been chosen represent the dedication and pride that is a corner stone of the U. S. Navy's Naval Air Depot's maintenance team. 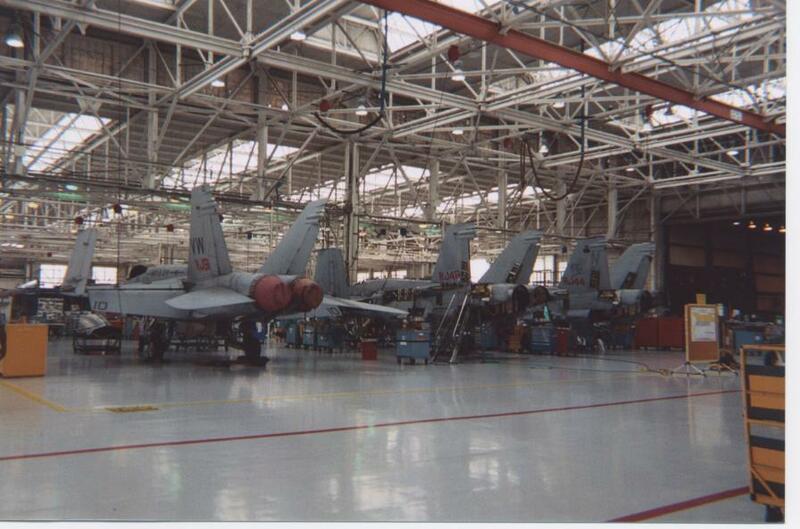 The photos show F/A-18C, C-2, E-2 and CH-53 aircraft & helicopters. 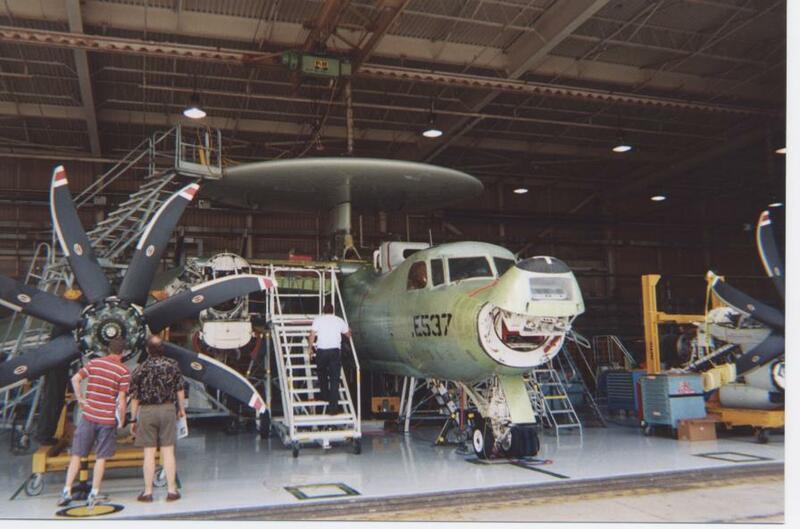 These aircraft help ensure our country's freedom and safety. These AMTs have a great responsibility and the AMTA recognizes and thanks these professionals for their knowledge, skill & integrity. 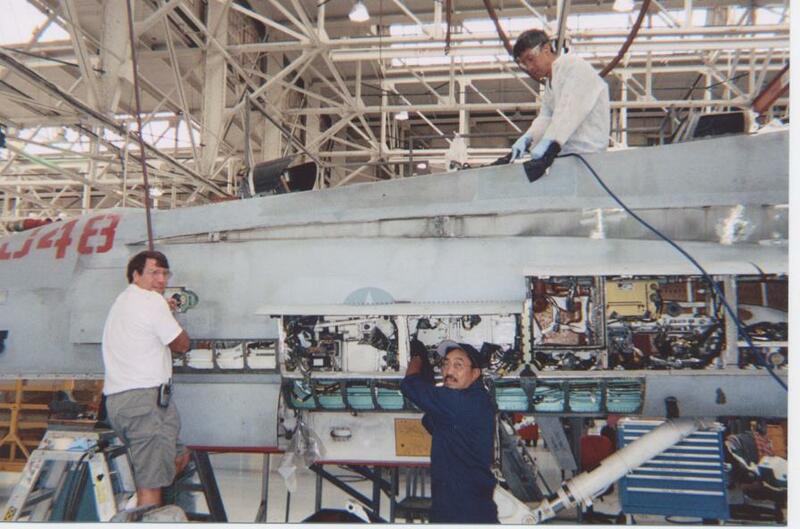 Ron White, (on ladder), repairs a highband receiver antenna panel while Ray Navarro, (blue overalls), repairs a circuit breaker bracket on an F/A-18C belonging to VFA125, which is a training squadron. 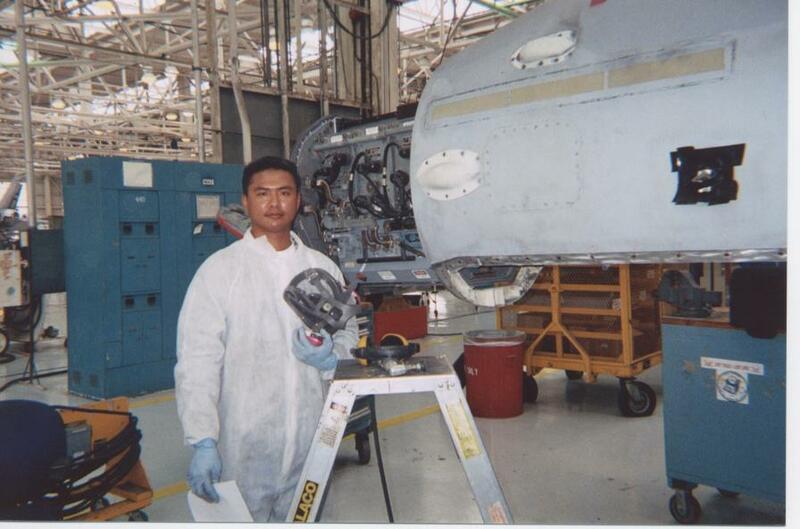 Alvin Apilado grinds corrosion off an F/A-18C's EMI sill. Corrosion is a harsh element that NADEP Technicians are vigilant against to help ensure the F/A-18C's ability to remain airworthy. Alvin is wearing protective gear because besides knowledge, skill & integrity these NADEP Technicians also practice safety; which benefits both the Technician and aircraft. Alvin Apilado takes a break to remove his protective gear to show that he is indeed one of the AMTA's many Faces Behind Safety. Evan Jimenez, (in white overalls), and William Icban take a second to have their picture taken. 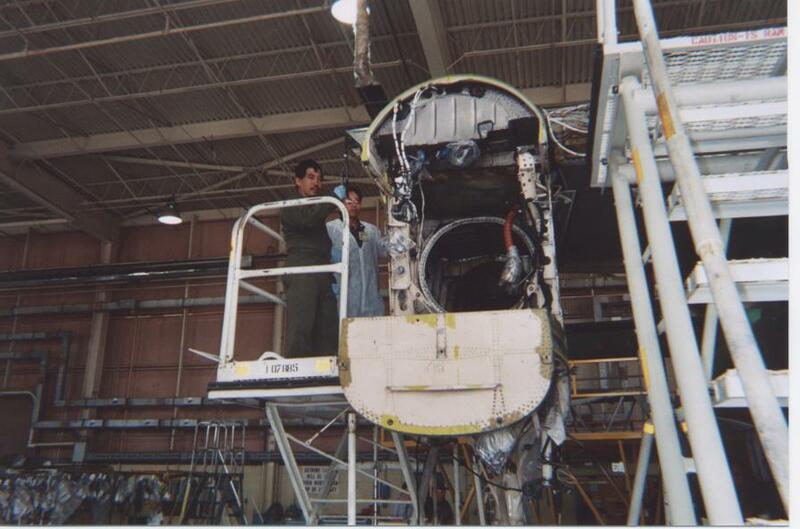 They are working together to repair a forward cockpit floor doubler which requires access from the nose wheel well and the forward cockpit. 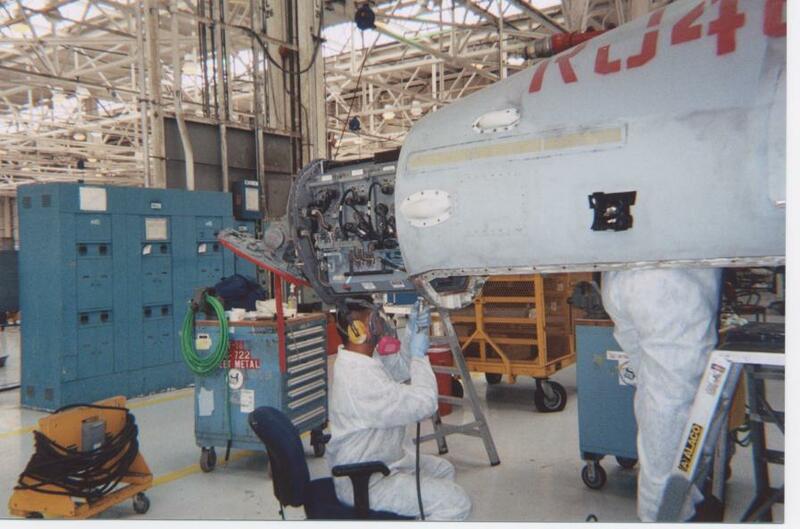 Teamwork and communication are essential in ensuring quality aircraft maintenance. Both of which Evan & William demonstrate on a daily basis. A veteran Technician secures a wire harness behind the cockpit of an F/A-18C. 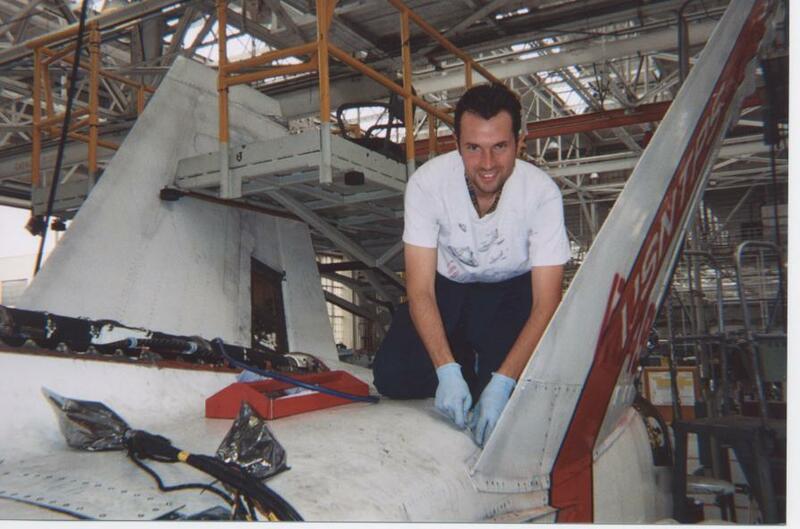 Dave Deck removes fasteners so the left hand vertical tail can be removed for inspection and repair. 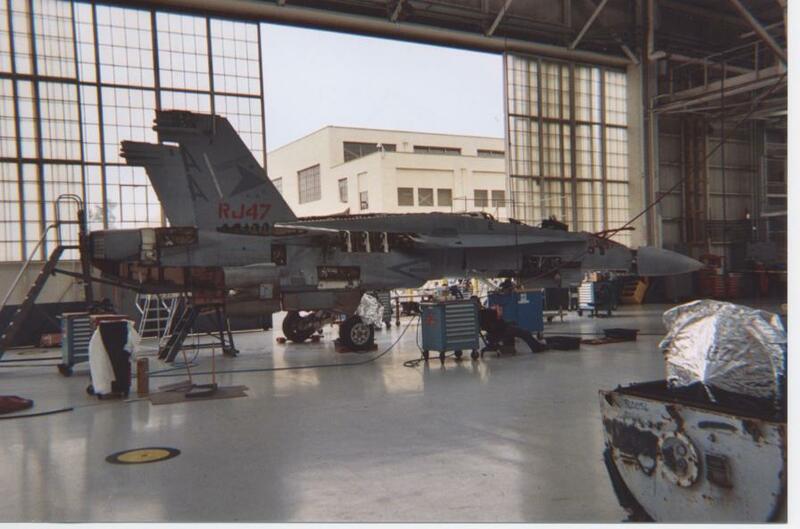 This aircraft belongs to the U.S. Naval Test Pilot School. 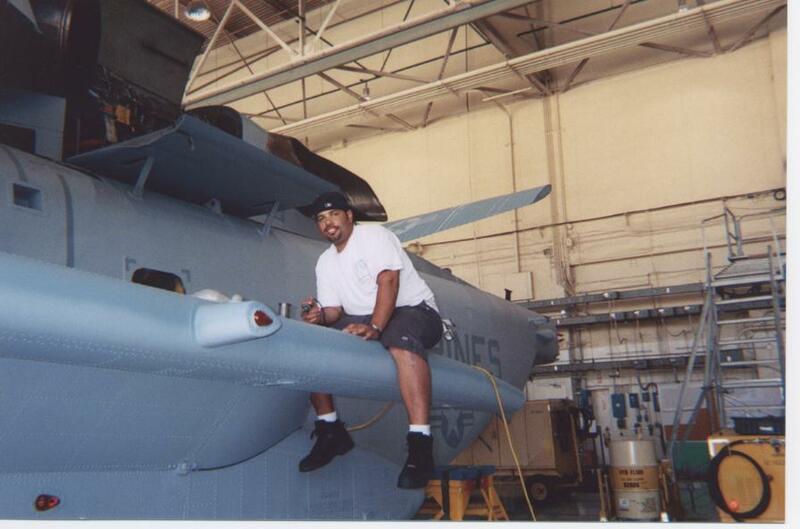 Victor Esteban is working on the left hand wing, inboard leading edge transmission on one of the U.S. 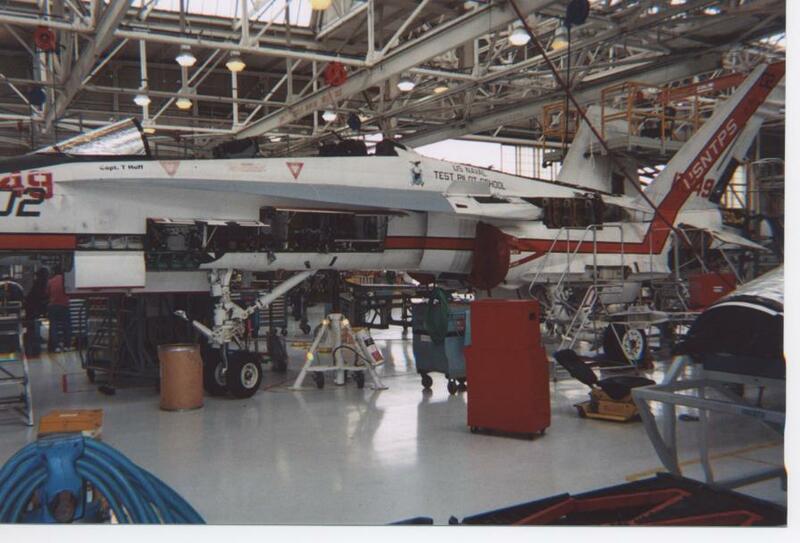 Naval Test Pilot School's F/A-18s. 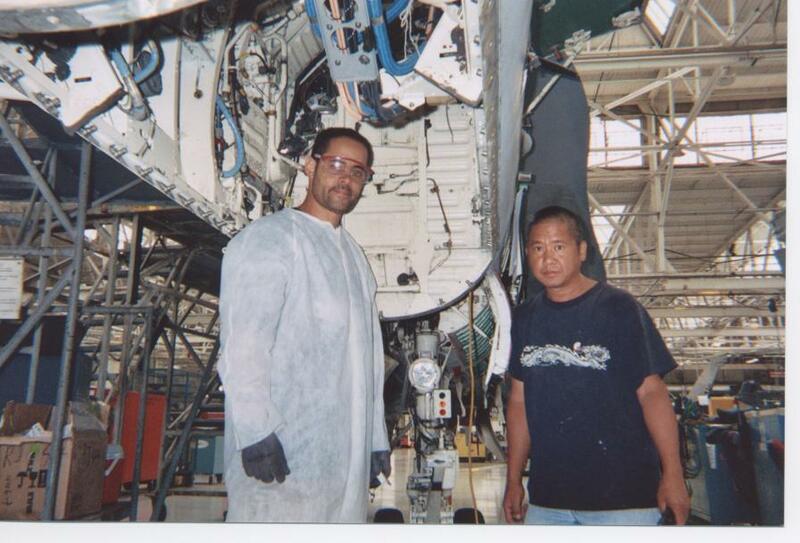 Noal Barrera and Arnold Taya work on the right hand wing hydraulic system of a C-2 aircraft. Robert Randle, (in blue overalls), Leslie Kinsey, (in green overalls), Lead Mechanic Robert Richardson, (center), Percival Alqueza, (second from left), and Bienvido Ragodon take a few seconds from their busy maintenance schedule to help the AMTA recognize the dedicated professionalism that they and their fellow NAVAIR Depot Technicians possess. 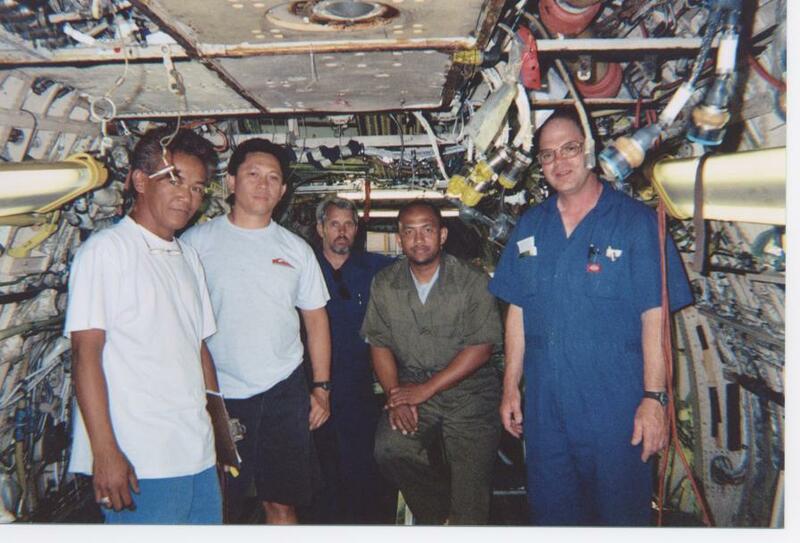 These skilled Technicians are inside the fuselage of a C-2 aircraft. 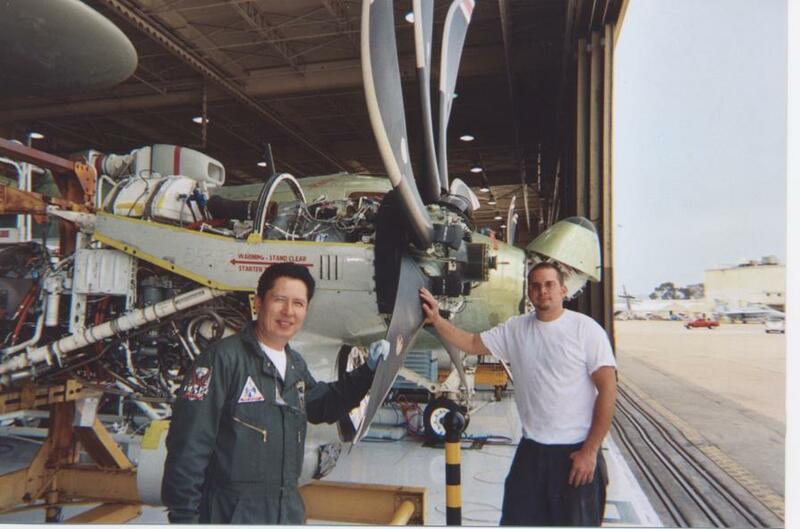 Christopher Lapid, (left), and Noah Apgar show a eight bladed T526-A427 engine that is to be installed on a E-2 aircraft. 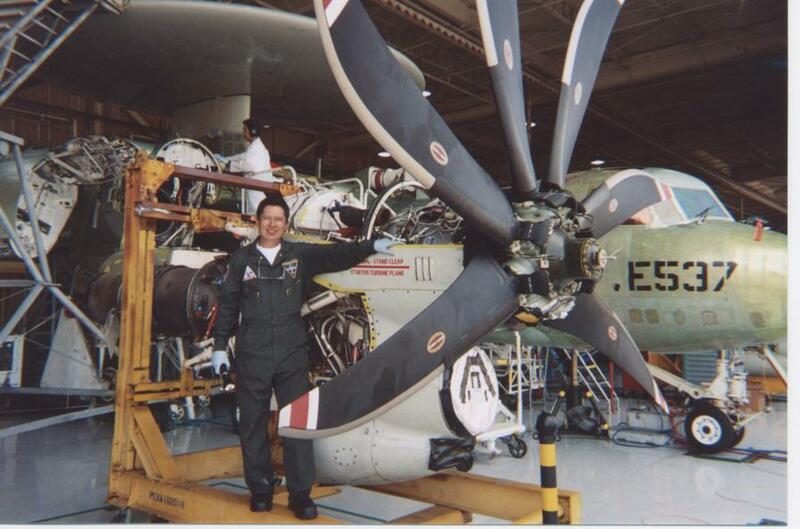 Christopher Lapid stands next to an E-2's eight bladed engine that is ready for installation. 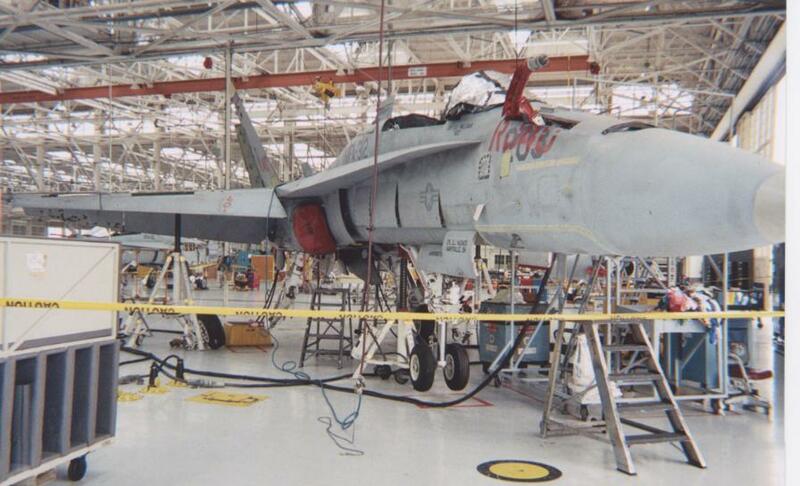 Notice the lower blades have been removed in order to fit on the engine stand. 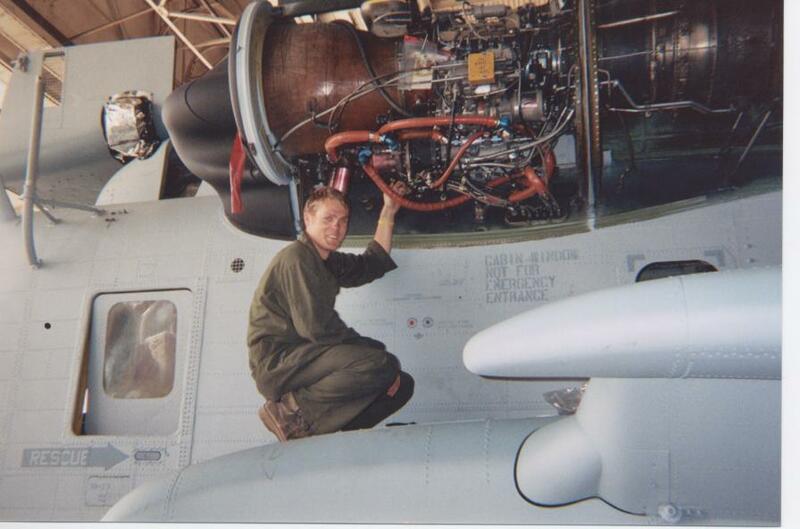 Matt Pendleton takes a second while working on the engine cowling of a CH-53 helicopter. 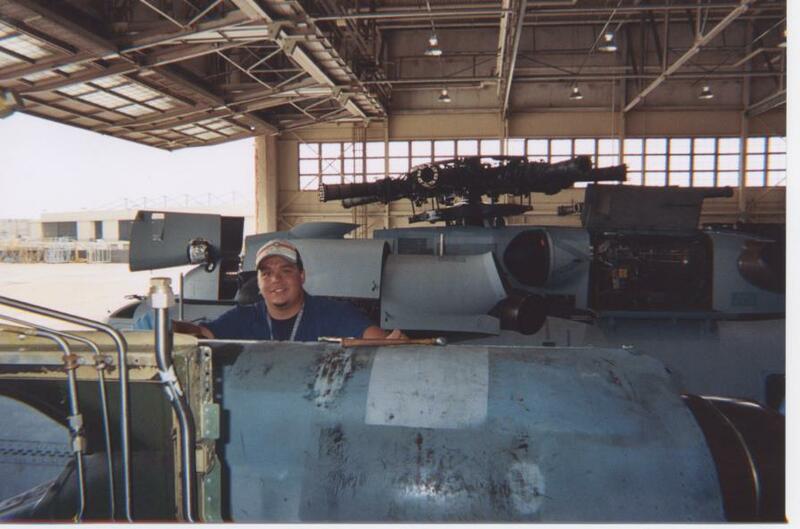 matt is a proud example of the qualities that make up a NAVAIR Depot Technician. These qualities ensure that this CH-53 Sea Stallion will be ready for service to help defend our country. 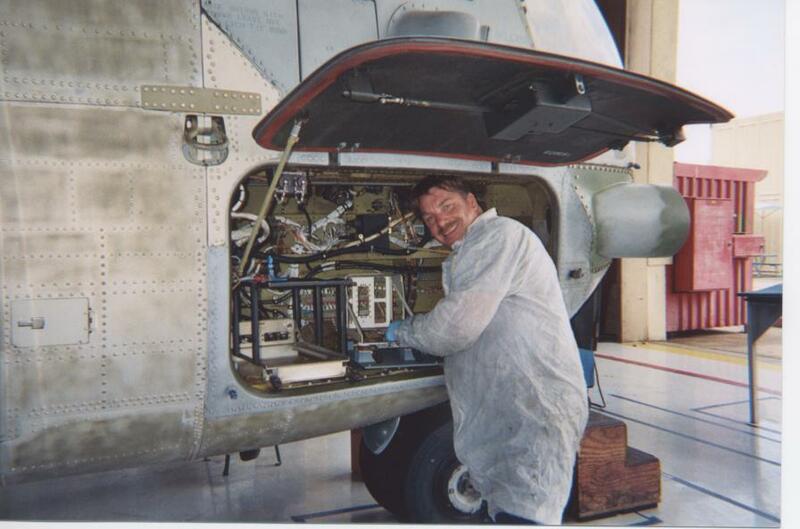 Edward Evers is working in the avionics compartment of a CH-53 Sea Stallion. 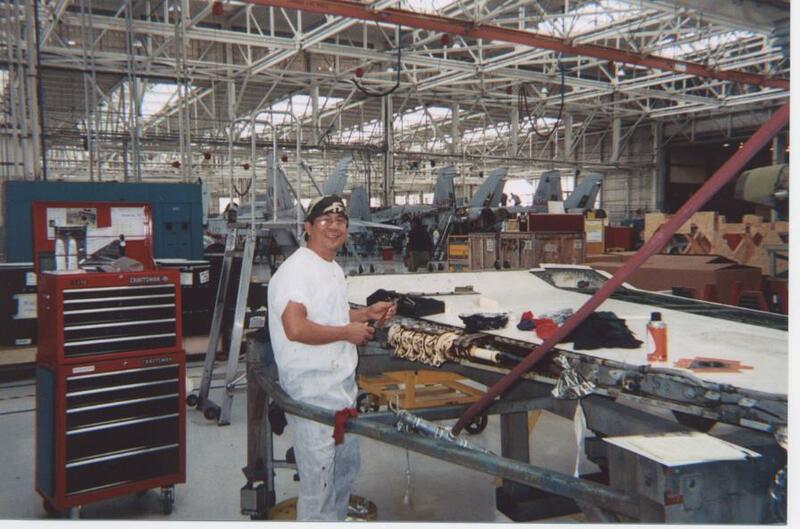 George Nacker is working on the left hand oil system of a CH-53 Sea Stallion. Ray Brito takes a few seconds from soldering wires to a cannon plug that connect to the CAD system. The pictures below are an example of the depth that the NAVAIR Depot Technicians go to that ensure our U. S. Navy's fighting ability remains capable of accomplishing any task given them. Through knowledge, skill & integrity these proud Technicians guarantee safe, airworthy aircraft that help provide our country's freedom and that of our allies.